Anne Boden says a trap located 50 metres from her property, along an old rail line, killed her two-year-old dog Hank. A Hay River, N.W.T., woman is warning other residents to be careful after her dog was caught and killed in an abandoned wolf trap last week. Anne Boden says her two-year-old dog Hank went missing last Tuesday. The family found him dead on Sunday while out on a bike ride. "We just happened to drive down here with the kids and our other dog started going nuts," she said. 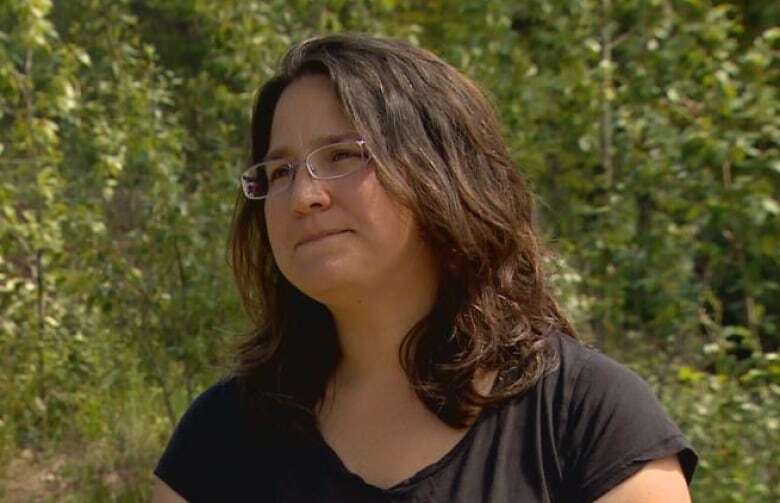 "We were looking cautiously in the ravine and my husband was helping me and that's when we saw the dog lying down in the ravine and he went a little closer to check and it turned out he was snared in a wolf snare and he was dead." 'If you're walking your dog... be aware,' says Anne Boden after her dog, Hank, was killed by a wolf trap near her Hay River property. 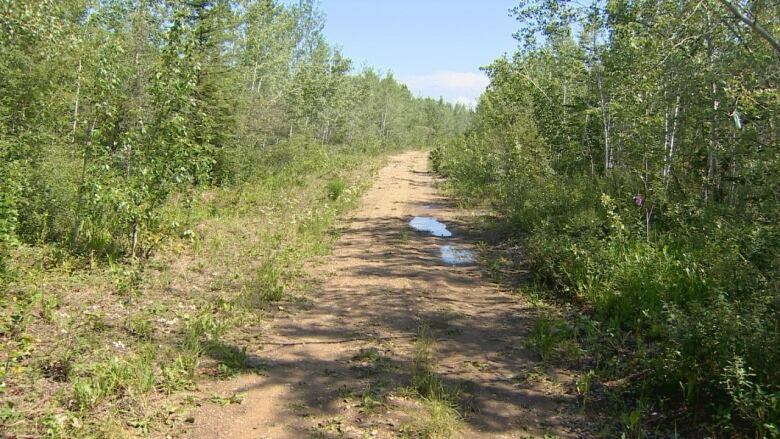 The road where they found the dog is an old rail line within 50 metres of Boden's property. Jerry Hordal, a renewable resource officer with the Department of Environment and Natural Resources, said trapping season runs from August until May. 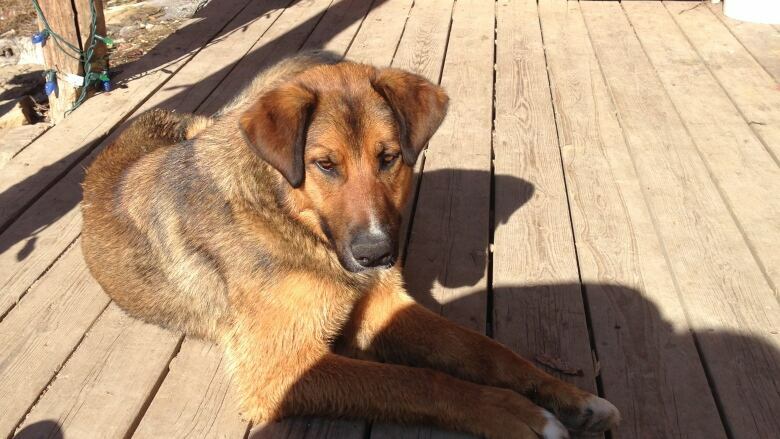 The trap that killed Boden's dog was at least five years old and had been abandoned, he said. "If people are setting traps around an area, they should be checking them fairly regularly and removing them at the end of the season," he said. Borden says she didn't know there were snares in the area and is concerned there may be more. "We understand living out here we have bears, we have coyotes, we have wolves and the highway isn't too far, so if a dog wanders, stuff does happen. But something like this is just totally avoidable and just irresponsible." "If people do want to set traplines or snares, either inform the property owners that are adjacent to where you're doing it or go somewhere you know you're not going to catch a dog because you're within municipal boundaries here and unless ENR is aware you're doing it, I don't see why you're here," she said. "If you're walking your dog ... be aware that you could be somewhere that someone has set snares or traps and you could lose a pet."